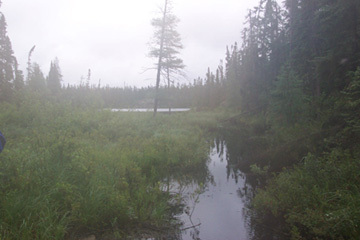 This trip into Wabakimi, in north west Ontario, put us into the spruce bog / Hudson Bay Lowland type of landscape that we experienced on the lower Missinaibi River a couple of years ago. Added to this were the effects of a bad storm in October 2001 which resulted in large areas of 'blowdowns' along most of the route. 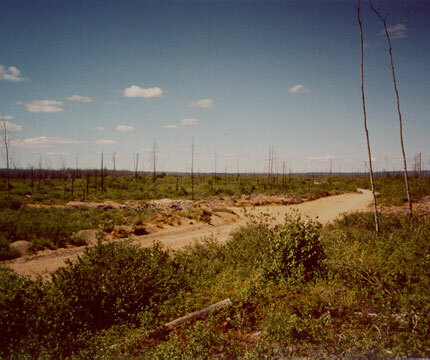 On our way to Armstrong, we drove through huge areas of clear cut. The soil base is sandy, therefore easily eroded. It was a wasteland!! The controls over this kind of activity need to be tightened up substantially in order to allow the forest to regrow naturally. 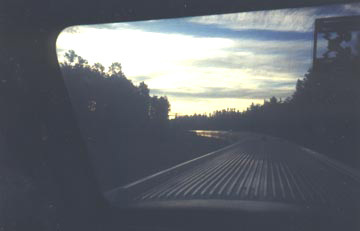 The VIA Transcontinental pulled into Armstrong at 7:00 am. 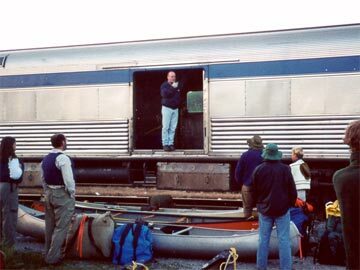 There were about 20 canoes that had to be loaded into the baggage car. Due to lack of space in the regular car, we were put into the 'dome' for the hour ride to Allanwater Bridge, where we put in. We expected with the number of people putting in at the bridge, that we would see them over the next few days, but after about an hour on the river, there was no one to be seen. 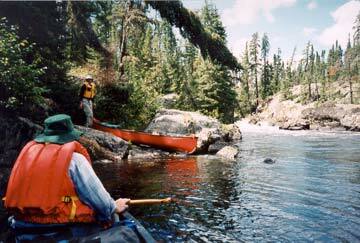 We ran ten sets of rapids varying from class I to class II technical and portaged twice on the first day. One of the portages was nearly impassable with blowdowns. The information we got from Wildwaters was inaccurate! 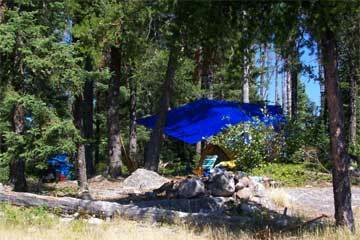 Many of the campsites on their maps did not exist or were less than useless. 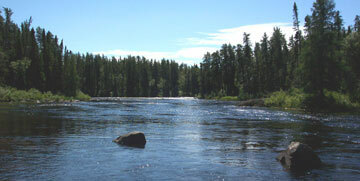 Termite Lake Falls. This one was not runnable. 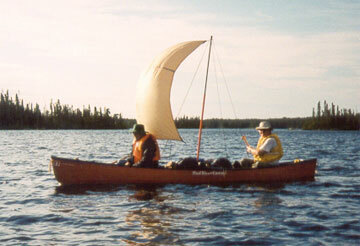 We rigged the sail at the south end of Termite Lake with the hope that the wind would cooperate. Very little cooperation = very little sailing. The water in this area is supposed to be quite good. 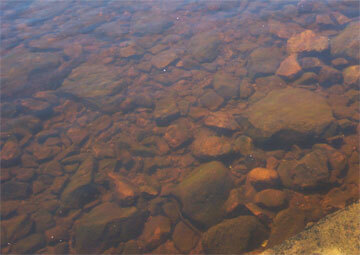 This was about 1.5 m deep and very clear. But we filter any that we drink. 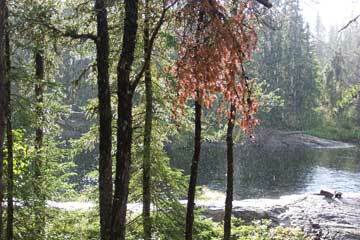 After finding a good campsite and dining on Almond Chicken, we experienced a severe storm which lasted about two hours. High winds, lots of rain and an excellent lightning show. 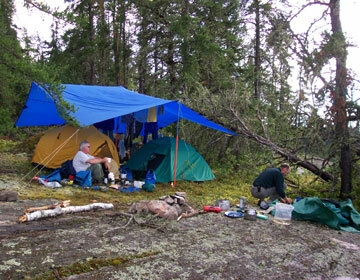 The rocky surface of the site made trenching around the tent difficult. Several storm cells went through that night. Thank goodness for the tarp! 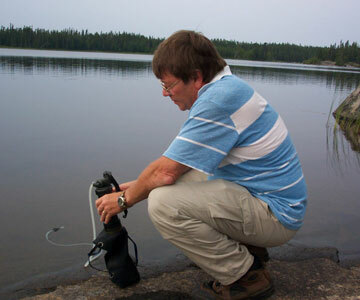 Dave tried to catch supper. We ate something else that night! No matter how you look at it, it is not runnable! We must be bear magnets! 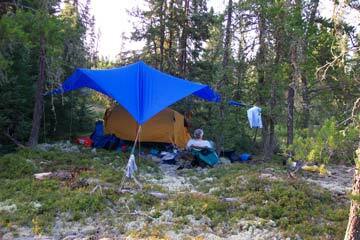 About 11:00pm, we awoke to a bear shoving on the tree to which we had tied our food. It may have been lured in by the smell of fish on the cooler. We had some for supper and had cleaned (we thought) the cooler sufficiently. The bear left after a while, but it was a bit difficult to get to sleep. 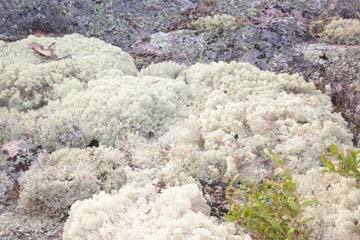 This site and others had a thick carpet of moss. Quite soft to lie on! Lower Brennan Falls - a drop of several metres. 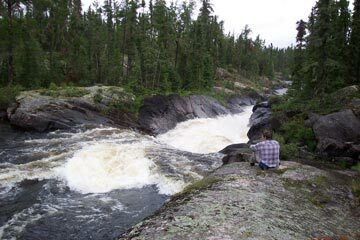 After being caught on the portage in a deluge which soaked us to the skin, we set up camp on an island below Lower Brennan Falls and dried out. The rain tapered off a bit and the sun came out for a while. 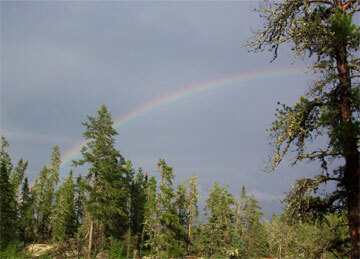 We were even blessed with a rainbow! A turkey dinner was in order to celebrate the sky clearing. 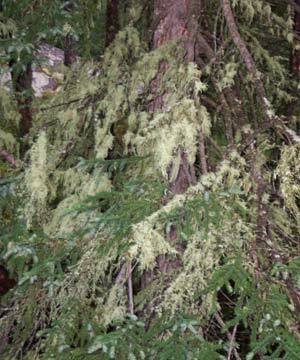 The spruce trees were draped in moss. 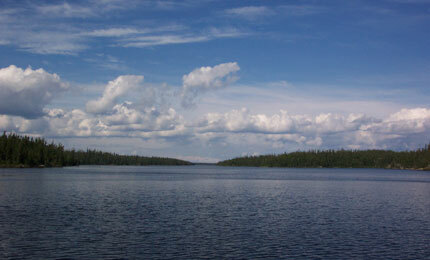 We carried over two portages into McWade Lake and paddled its length (10 km) only to find that there was no way to get through the north end into Lower Wabakimi Lake. The outfitter's maps showed 2 portages. After checking 1 km on either side of the location, we gave up and paddled back down the lake putting us behind by a day. Half way along the lake, we stopped for lunch and saw a bear at the water's edge. It scampered into the bush when it saw us. 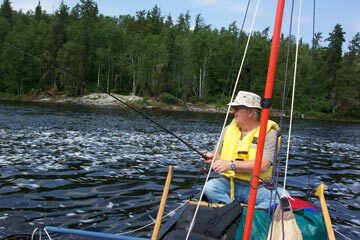 We joined up with another tripper and his collie just before running the Sturgeon Rapids. 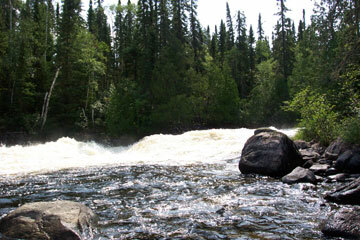 The portage around was impossible even though our outfitter information said otherwise. 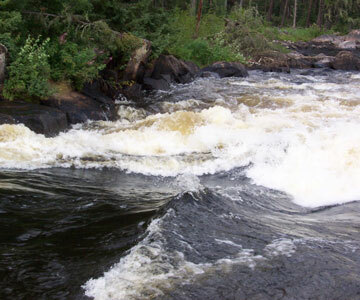 Class 2+ with big waves covered me in the bow of the canoe. We shipped quite a bit of water, which made manuevering a bit tricky. - a great addition to the 'crew'. 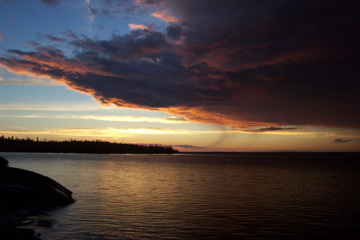 After a squall went through, we had a great sunset. 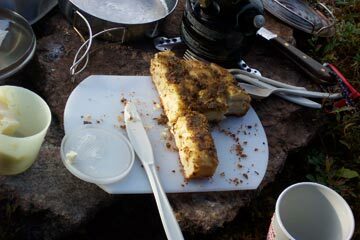 That night, the outback oven proved its worth in producing a Foccaccia Bread which, according to our poll, was excellent. 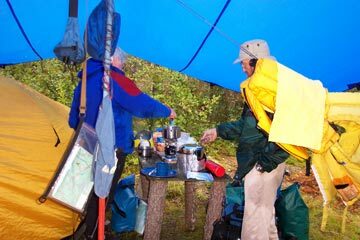 We set up camp at the west end of Smoothrock Lake and dried out some gear that had suffered the consequences of the previous day's deluge. 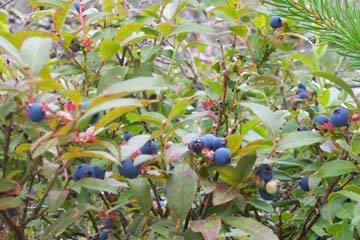 The blueberry crop this year was outstanding. 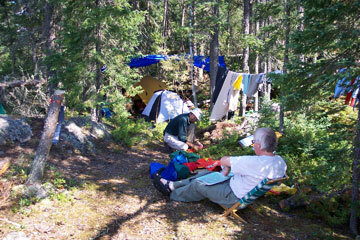 Every campsite and portage was thick with them. 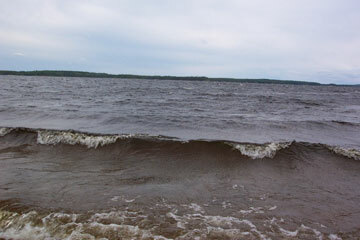 The pull across Smoothrock Lake wasn't easy - wind and wave gave us a challenge. The rocks may be smooth, but the lake sure wasn't! It stayed wet for a couple of days. 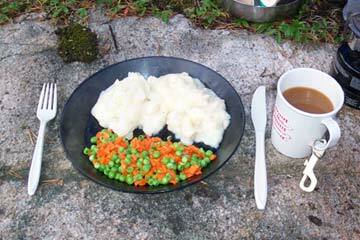 After a long, wet day of paddling it was nice to find a fairly good campsite and get some hot food into us. 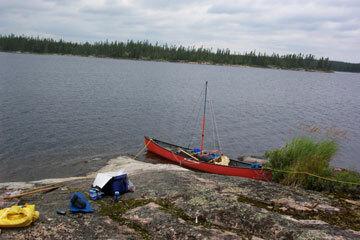 Our last day on the water was quite good - winds light, no rain and calm water. 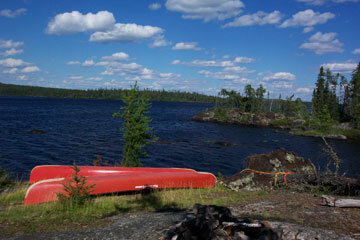 We set out early in order to get across Caribou Lake before wind became a problem. We sailed 18 km, averaging between 6 and 10 km/h. 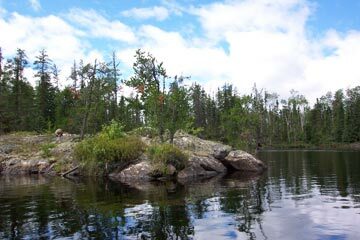 Along Little Caribou Lake, this island shows well the tenacity of vegetation. There was virtually no soil on it, yet several trees had survived over many years. In summation, this trip does not rank up there with others that we have done. Although we did have some good days, where most things went well, there were a number of negatives that more than balanced those! The weather was routinely dismal with few breaks. 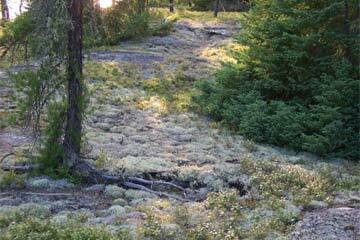 My expectations of the area were higher than realized in terms of the landscape (burned-over areas and blowdowns). 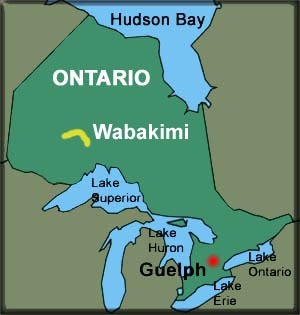 Information that we had received from Wildwaters Wabakimi Outfitters was largely inaccurate, which made campsite and portage location quite difficult, or impossible, at times. Hopefully next year's trip will make up for this one!